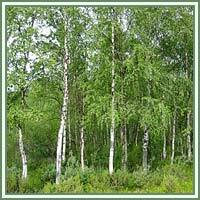 Habitat: Silver birch is distributed throughout Europe and Asia minor. Grows on dry and sandy soils. Description: Deciduous, medium-sized tree (grows up to 25 meters in height). Young trees have reddish-brown bark, which turns silvery-white as they mature. Diamond shaped black marks appear at the bark’s base. Leaves are triangular, double-toothed along the margins, pointed at the top. Flowers are grouped into catkins, produced before leaves, in early spring. Small, winged seeds ripen in August. Useful components: Flavonoid glycosides, methyl esters, phenylpropanoids, steroidal saponins, methylsalicylate and resin. Medicinal use: The plant is a strong diuretic and laxative. Generally it is considered useful in reducing inflammation, increasing perspiration, and relieveing pain. 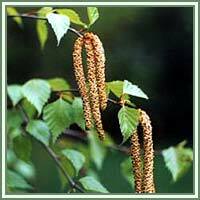 Used internally, Birch has shown to be very helpful in treatment of arteriosclerosis, arthritis, cystitis, fevers, gout, rheumatism, and kidney stones. External use is helpful in cases of psoriasis and eczema. Silver birch’s sap has strong astringent properties, increasing elasticity of the skin.